Speaking on a panel at the W20 in Berlin on Tuesday, President Donald Trump’s daughter Ivanka Trump received an icy response from audience members when discussing her father’s policies on women in the workplace. Trump was discussing the lack of paid leave policies for women in the United States, and she said she was ‘very proud of’ her father’s advocacy for paid leave, calling Mr. Trump a tremendous champion of supporting families. It was then that reports of hissing and boos came from the audience, though they were not audible on video from the event. Ivanka gets booed and hissed by audience when she says her father is a"tremendous champion of supporting families." Moderators were quick to take note of the reaction, though, and interrupted Ivanka Trump. “You hear the reaction from the audience so I need to address one more point,” one said, going on to ask whether some of the “attitudes toward women” President Trump “has displayed in former times” might lead some to question his record on women. “I’ve certainly heard the criticism from the media, and that’s been perpetuated but I know from personal experience and I think the thousands of women who have worked with and for my father for decades when he was in the private sector are a testament to his belief and solid conviction in the potential of women,” said Trump. After the event, Trump dismissed the reaction to her appearance on the panel. “We have to be able to have different viewpoints and feel comfortable candidly expressing ourselves without fear of being labeled and ostracized,” she said. Ivanka Trump had been spearheading the Trump administration’s policies on paid leave and child care during Mr. Trump’s presidential campaign and after securing a West Wing office, acting as an unpaid adviser to the president. Mr. Trump has previously made proposals regarding paid family leave, including rewriting tax code to allow working families to deduct childcare expenses from their income taxes and guaranteeing six weeks of paid maternity leave for those who currently are not offered leave by their employers. Speaking in Germany in an interview with NBC News, Ivanka Trump shot down some of the headlines in Germany that have described her a “loyal accomplice” to her father. “I don’t like the word ‘accomplice’ because in this context, I don’t know that’s productive,” she said. 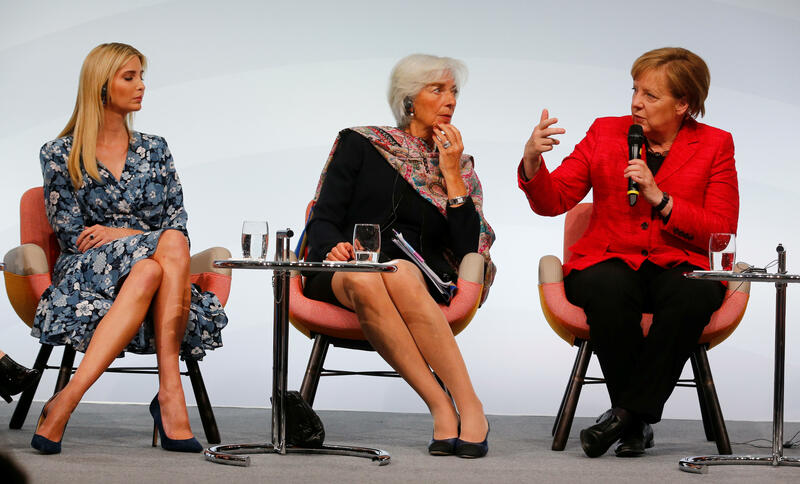 German Chancellor Angela Merkel had extended an invitation to Trump to the W20 summit to speak on a panel discussion regarding Women’s Economic Empowerment and Entrepreneurship. The White House says Ivanka’s visit had stemmed from a roundtable event Trump had hosted with Chancellor Merkel at the White House back in March. Trump is expected to continue her visit to Germany with a tour of Siemens Technik Akademie and a stop at the Memorial to the Murdered Jews of Europe in Berlin to commemorate Yom HaShoa, or Holocaust Remembrance Day.